These little treat bags are quick and easy to create with just a few supplies. Fill them with candy or small treats and you will be the most popular host. 2. Check the placement of the ghost so that he is centered on the bag. Add a dab of glue on the bag and adhere the ghost head. Fluff out the ghost body. Let dry. 3. Add two dots on the ghost head to represent eyes. 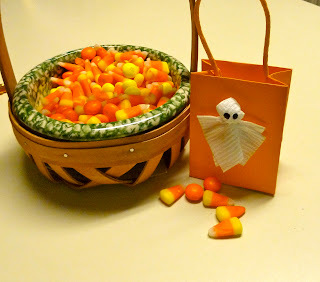 Fill the bag with candy or small treats. Such cute ghosts!! The bag is really nice! Easy and nice!! I really wish Halloween was celebrated at Greece the way it is out there!! So cute! Thanks so much for sharing tutorial! This is so cute Crystal! Love it!!!! Those treat bags are sooo sooo cute!!! Thanks so much for sharing your talents at the Tuesday To Do Party! That's so very cute! Love it! paper towel ghost!!! You are so smart! This is so cute! I love that it's just a piece of paper towel.. Too cute :) Just wanted to let you know that I featured this from the Weekend Wonders Party. Come grab a feature button if you'd like :) Have a great day! Looks so cute. So simple. Thanks so much for linking up at Romance on a dime! Adorable idea. Thanks for sharing on BeColorful. Cute idea and so easy to make.